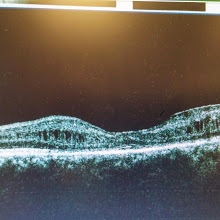 Note the schisis changes in the middle layers of the OCT of the macula. Retinoschisis refers to a splitting of the neurosensory retina. Can be 1. degenerative peripheral schisis 2. congenital X linked recessive schisms 3. secondary forms associated with some form of vitreoretinal traction, optic pit or pathological myopia. Note that X linked recessive schisis is has a foveal schisis that does not leak on FA The gene associated with X linked schisis is RS1 (retinoschisin) leading to damaged Muller cells. May be associated with peripheral retinal schisis in up to 50% of patients and the split is in the nerve fiber layer (where as in the degenerative retinoschisis the level of splitting is variable and usually occurs in the deeper layers). ERG - Flat B wave with "negative wave form" appearance.